Combine ground beef, cheddar cheese, and 4 crumbled slices of the bacon into a bowl. Mix together lightly. Form the meat mixture into balls and gently flatten into patties of desired thickness. Take the cooked patties out of the pan and place on a plate with paper towels to drain the grease. Place the chopped mushrooms into the warm pan and fry them until they are golden brown. Toast your hamburger buns on medium heat in the toaster oven or place on grill. Then, spread ranch dressing on one side of the bun. Take the drained patties and place on the bun. 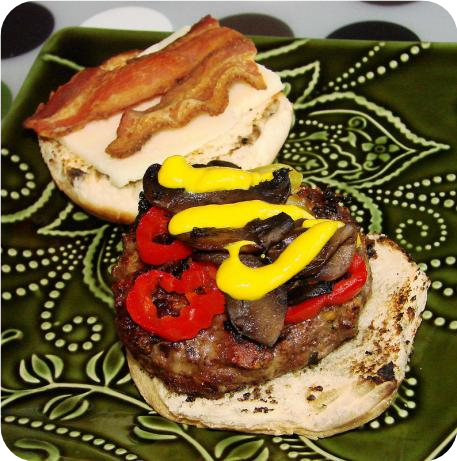 Place 2 slices of the cooked bacon on top of the burger, along with the fried mushrooms. You can also top with additional cheese if desired.